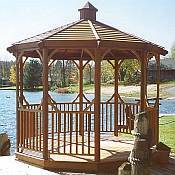 Our Garden Gazebo Kits can provide a stylish shelter for an outdoor hot tub spa, or an ideal pool side changing room. 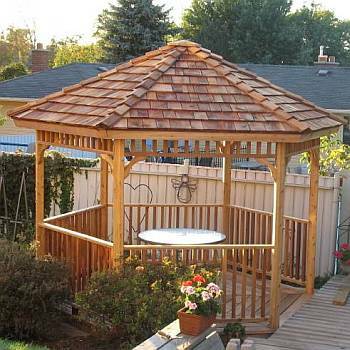 In a yard or garden, a Wood Gazebo Kit is easy to build and will be the perfect place to relax or to hold family dinners, weddings, and other special events. Why not indulge yourself with a garden gazebo to help you enjoy your garden? A gazebo project is not as difficult as it looks. Think of it as a series of several shorter projects with an end goal in sight for each. You can assemble all the smaller parts in your garage or shop (especially on rainy days). A project like this would take two experienced carpenters 5-9 working days from to finish. If you have several friends help you with the foundation and framing, you can spread these tasks over a few days. 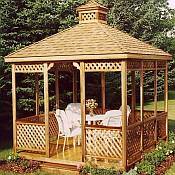 Cedar, and Western Red Ceder in particular, is an excellent choice of wood for your Gazebo. It is highly durable, resists moisture rot and decay. The oils it contains acts as a natural insect repellant. Due to its hygroscopic make up it has low shrinkage, twisting and warping. It also does not check (outter edge cracks) as much as do most other woods. It is lighter weight in relative density without loosing its strength. It is easy to cut, drill, and sand. It can be painted. Lastly, it has a beautiful appearance and light fragrance. 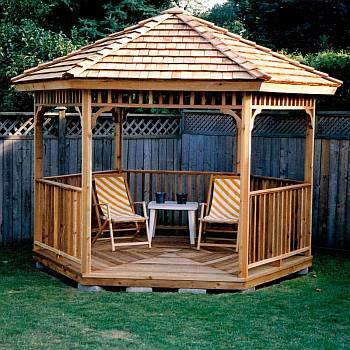 Our beautifully designed Cedar Gazebos enhance any setting and allow you to easily customize them for your pleasure. Make a focal point in your garden area or just build a place for entertaining in your backyard. A gazebo allows you and your family to spend more time outside and to enjoy your patio area. Our kits come with detailed instructions to help you build a quality gazebo that will last for years. 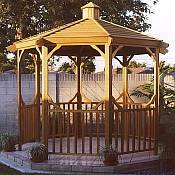 We have a variety of options and accessories that allow you to create the gazebo you have always wanted.